Home Customer Stories MAGNATRAC RS1000 Small Bulldozer Pays for Itself! Winter has come and gone and now, Spring is here. For Carlton, a MAGNATRAC RS1000 Owner from New Jersey, Winter is no problem at all. Why? His MAGNATRAC was there to support him. Carlton said the picture below is of the two stumps still in the ground and the hole on the right is where his MAGNATRAC had just removed the largest stump of the three. 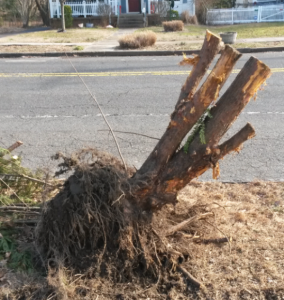 Take a look at how large that tree stump was! The best part about all of this? 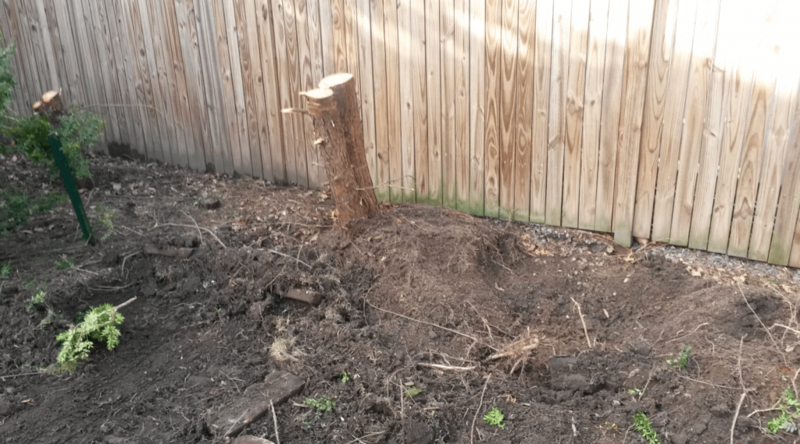 “It took me about 2 hours of work with minimal amount of manual labor (had to chop 2 large main roots),” remarked Carlton. The MAGNATRAC® RS1000 features 360-degree turning capabilities and swivel hip maneuverability that’s controlled with two track steering levers. All you need is a gentle nudge from your finger, and you have an easy to control machine that is capable of lifting hundreds or hauling almost a full ton. Large boulders, fallen trees, are no match for the compact power in this personal bulldozer. The compact size fits easily around trenches and the quick response transmission doesn’t let anything get in its way. Your project is cleaner, faster, and fun! Manual attachment options make the RS1000 a great entry level, assembled machine, and hydraulic attachment options make it even more versatile for those looking to accomplish larger projects. You can custom build your own MAGNATRAC® RS1000 with attachments of your choice. Just call for a free consultation to get all the answers and input necessary as you plan your upcoming project. It’s no wonder why some people have owned Struck equipment for four decades or more. The customer service is just as amazing as the quality and craftsmanship of the MAGNATRAC® products themselves.